Personalization has been a topic of conversation among executives, marketers and leading brands for over a decade. In a study of 1,000 marketing professionals back in 2014, when asked to prioritize one capability that will be most important in the future, personalization topped marketers’ lists. Two years later, Forbes dubbed personalization the “holy-grail of marketing.” Again in 2017, personalization kept up its illustrious reputation as Gartner’s “#1 strategic investment for brands” in 2017. We keep hearing about the importance of personalization but why don’t we see it more widespread—particularly in one of the most personal industries: Retail? Why don’t we experience it more as consumers? And why do we struggle to enable it as marketers? 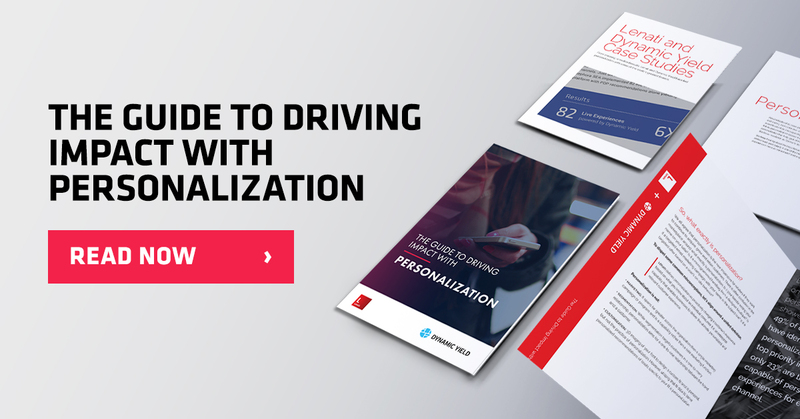 In this special guide, Dynamic Yield partnered with marketing and sales strategy consultancy, Lenati, to show you how to overcome data challenges and mobilize your organization to implement a personalization strategy that drives real customer and business impact.